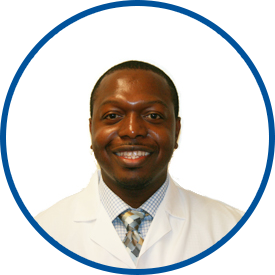 As a hospitalist at White Plains Hospital Center, Dr. Phillips serves as the primary care physician for Westmed patients while they are hospitalized. Dr. Phillips completed his undergraduate studies and received his BA degree in biology and chemistry from SUNY Potsdam College in Postdam, New York. He was awarded his medical degree from Temple University School of Medicine in Philadelphia, Pennsylvania and went on to complete his postdoctoral internal medicine training at SUNY Downstate Medical Center in Brooklyn, New York. Past employment for Dr. Phillips includes serving as a sixth grade science, math and physical education teacher at Frederick Douglass Academy IV in Brooklyn and preparing inner city high school students for the SATs as a Kaplan SAT/PSAT instructor in Philadelphia. Dr. Phillips is a member of the American Medical Association and the National Medical Association. He joined Westmed Medical Group in August 2010. Dr. Phillips is a native of Guyana.